All images except the first two have been added from our own website. Click on the others for more information. Click on all the images to enlarge them. — Jacqueline Banerjee. Most historians date the beginning of spin in Britain to World War II or the Great War, but here Paul Brighton unearths a much earlier relationship between press and politicians. From Peel and Palmerston to Gladstone and Disraeli, Prime Ministers have all tried to manipulate the press to a greater or lesser extent. Using original research and unpublished sources, this book reveals covert contacts between Westminster and Fleet Street for the first time. 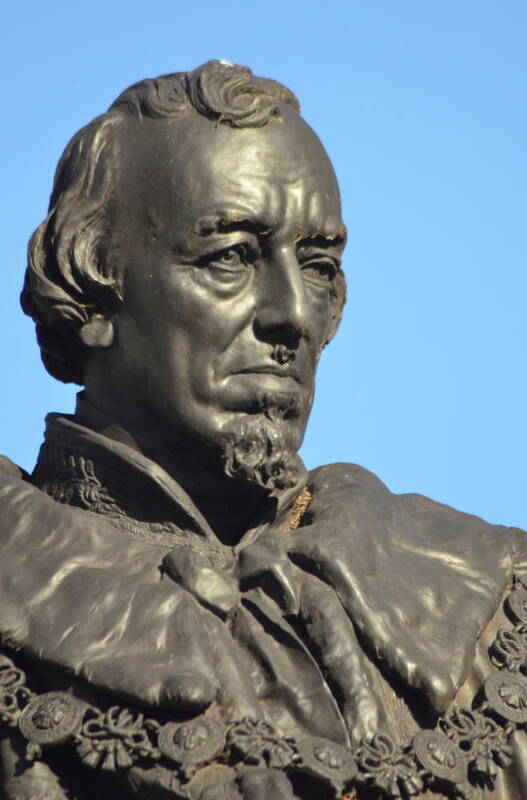 The relationship which the publishers claim that Brighton has unearthed would be well-known to anyone who is familiar with the major biographies of Victoria's Prime Ministers published in the last 50 years. Brighton's footnotes, citing his sources, more often refer to those very biographies than to the unpublished sources mentioned on the back cover. It is more reasonable to claim, as the cover does, that this is the first book to concentrate on that aspect of government and to trace it through from 1783 to Salisbury's resignation in 1902. 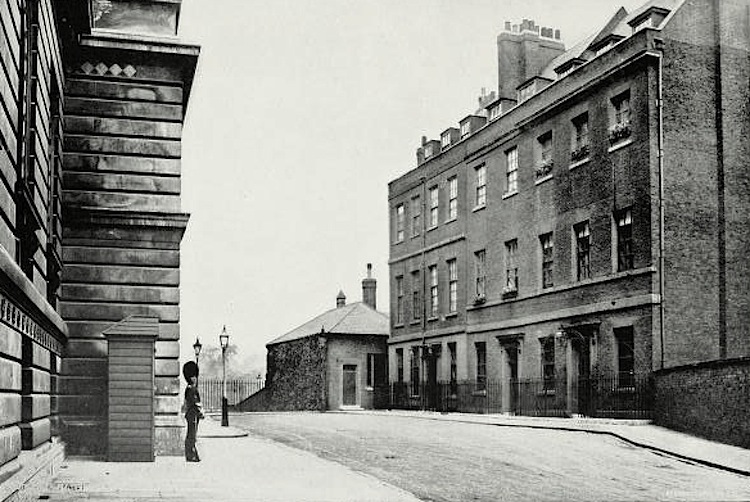 10 Downing Street in the early twentieth century. Source: West, facing p. 214. There are ten chapters and six are devoted to individual Prime Ministers: Pitt the Younger, Derby, Aberdeen, Palmerston, Disraeli and Gladstone. The other four chapters each cover a pair: Liverpool and Wellington, Grey and Melbourne, Peel and Russell and Salisbury and Rosebery. Before the ten chapters on specific periods there is an introduction and they are followed by a conclusion which don't offer as much analysis and refection as they might have done. The book makes few assumptions about the reader's familiarity with nineteenth century political history so a fair amount of each chapter is taken up by a general background account leaving less space than one might expect for material that addresses the ostensible subject of the book. That is just as well in some cases because there is not much to say of real interest about Prime Ministerial relationships with the press. is it possible to correlate growth of the electorate with the growing influence of the press and closer attention to the press by party leaders? what are the respective impacts of proprietors, editors and other employees and freelance writers on the political stance of papers? how does the power of newspapers in the late nineteenth century compare with their power when first radio and then television were in most homes? is it more common for newspapers to support a political cause because it looks like winning or to be the occasion of a cause's victory? how many examples are there of a politician being involved in the ownership of a paper and, as a result, gaining a clear advantage over the opposition on his own side or on the other side? how easy is it to distinguish between a Prime Minister's legitimate efforts to make sure that what he says or does is reported accurately, fully and promptly and his more questionable efforts to persuade a newspaper to mislead the readership in his own interests and how often can we be sure that contacts with the press strayed into the second category? which methods of influencing what appears in newspapers are legitimate and which are less acceptable (out of, say, meals, offering articles to be carried whether anonymously or by a named author, flattery, general efficient briefing in good time, privileged access to accurate information/leaks, honours)? In most chapters some light is shed on one or more of these questions but Brighton doesn't generally attempt a considered answer to any of them. The title of the book invites the reader to consider whether spin is objectionable or simply a loose term to embrace any contact between the government and the press and it is a weakness that it is not crystal clear how Brighton intends it to be understood. In several places he includes a comparison between what was being done in the nineteenth century and what we have become used to in the last 35 years and in particular since 1997, perhaps to enliven the text. For some at least it will simply cause them to tease out just how the circumstances are different and why the comparison is less than helpful. Left: Lord Palmerston, photographed by J. J. E. Mayall. 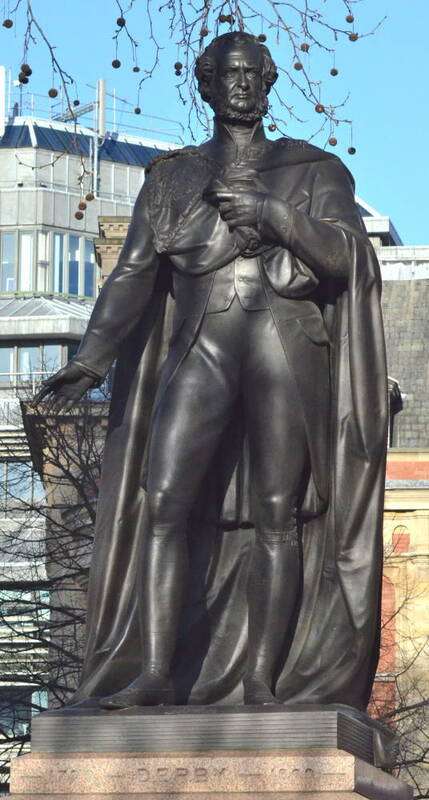 Right: Lord Derby, by sculptor Matthew Noble. The analysis drives the reader back to Quintus Slide, the editor of the People's Banner in Trollope's Phineas Finn, Phineas Redux and The Prime Minister. The Duke of Omnium, of course, would have been a good deal worse at press management even than Derby if he had been assessed by Brighton. 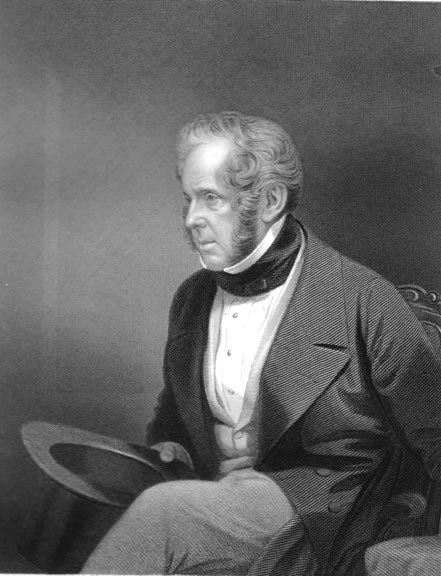 Equally realistic and putting Palmerston's point about money more gently was John Morley in his biography of Cobden: "The Times was Palmerstonian because the country was Palmerstonian, just as by-and-by it became Derbyite because the country seemed Derbyite" (175). Morley, of course, was a journalist who became an MP and served in Gladstone's Cabinets and then wrote Gladstone's three volume biography. He was not the only journalist to serve in Gladstone's Cabinets. Robert Lowe was much less close to Gladstone personally but he had been a long-standing leader writer on The Times and went on to be Chancellor of the Exchequer. Another aspect of press relations: then and now, caricaturists had a field day with Prime Ministers. This is Harry Furniss's famous take on Gladstone. What was new about Midlothian was not that Gladstone spoke from the platform. This was already common-place for many front-rank politicians. It was the fact that the campaign was effectively designed as a media event, with specific attention to the deadlines and operational requirements of the journalists covering it and crafted for maximum impact in the morning and evening papers. Paul Brighton is Executive Principal Lecturer and Head of the Department of Media and Film at the University of Wolverhampton, and was previously a journalist who worked for Radio 4 and BBC News 24. This pedigree may explain some features of the book which will please some and irritate others such as the occasional livelier phrase than one might expect in a scholarly book and the occasional use of phrases such as "may well have" to include something for which there is limited evidence. There is also some carelessness as when Tony Blair is described as a right-of-centre leader of a left-wing party who was attractive to the Tory press in a comparison with Palmerston and Rosebery. The Sun supports the claim but scarcely, say, the Daily Telegraph or the Daily Mail. Original Spin is an excellent idea and few readers will fail to find material previously unknown to them however familiar they are with the politics of the nineteenth century. [Book under review] Brighton, Paul. 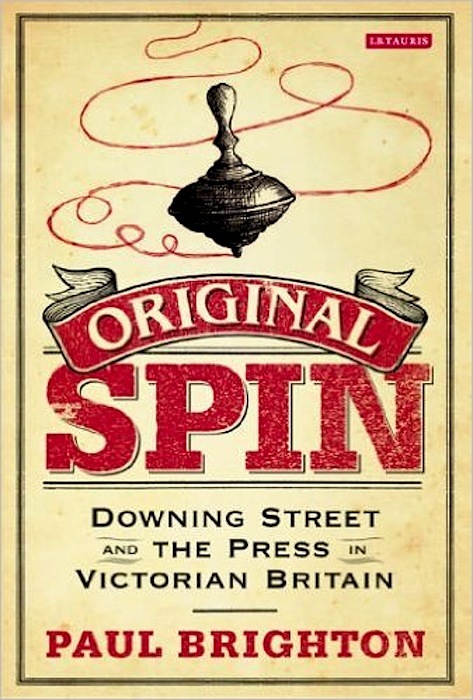 Original Spin: Downing Street and the Press in Victorian Britain. London: I. B. Tauris, 2015. pp.288. £22.95 ISBN-13: 978-1780760599. [Illustration source] West, Sir Algernon. Contemporary Portraits: Men of My Day in Public Life. London: T. Fisher Unwin, 1920. Internet Archive. Contributed by the University of California Libraries. Web. 27 November 2015.